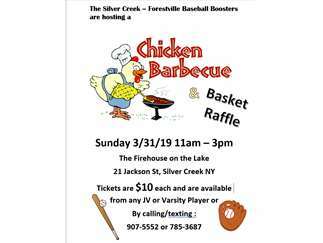 The Silver Creek – Forestville baseball booster club is hosting a Chicken BBQ and Basket Raffle on Sunday, March 31, 2019 at the Silver Creek Fireman’s Club. We are looking to raise money for our Modified, JV, and Varsity baseball teams.Individual Dinner tickets are $10 each and include chicken, sides and a dessert. Tickets can be ordered by calling 716-907-5552. There will be tickets available at the door on a first come first serve basis. A huge basket raffle will be taking place from 12pm-3pm and includes many great items including autographed items from the Bills and Sabres!